While I’m still researching the chemistry for one post and WordPress ate my other post (didn’t save my most recent drafts), please enjoy a couple of these “Cheese Pleasin’ Me” video contest winners as held by Hannah Hart, star of one of my favorite YouTube channels, My Drunk Kitchen. Enjoy! The cheese is produced in the period from August 15th to March 15th and may only be sold to consumers between 10 September and 10 May. This seasonal limitation is due to the fact that, traditionally, the cows were brought down from the Jura mountains to spend the winter in the stables. This form of pastoralism or nomadism organized around the migration of livestock between mountain pastures in warm seasons and lower altitudes the rest of the year is called transhumance; and this tradition is still maintained in Switzerland today. When the grazing season is over, the Montbéliarde and Simmental cows are kept indoors and are fed hay, silage and grain and are generally in the second stage of lactation, giving less milk and producing milk rich in fat. What makes Vacherin Mont d’Or unique is that unlike most of the other major cheeses of the world, which achieve their depth of flavor from spring and summer milk (considered the creamiest and most desireable), this cheese is exclusively made from the milk of cows fed on cold-weather vegetation. 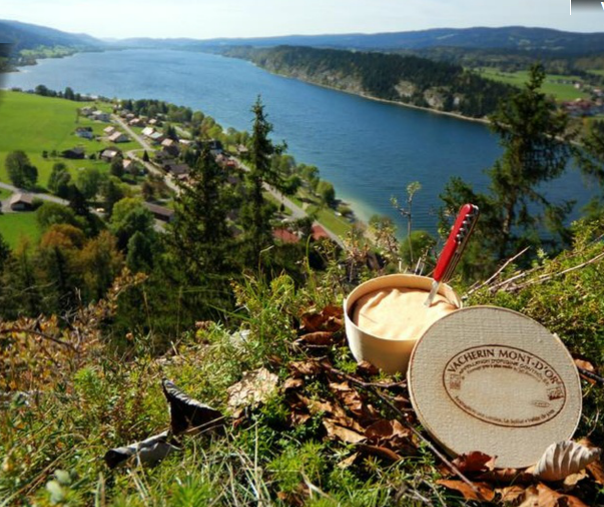 Vacherin Mont-d’Or Switzerland AOC is a soft cheese made from whole raw cow’s milk. The milk is quickly curdled with animal rennet at the same temperature of the milk inside the udders (more than 33 °C). Quick renneting time, together with the high fat content of the milk, results in ‘soft’ curds. The cheese is lightly washed with a brine solution and develops a creamy consistency that is white to ivory in color with a yellow to light brown rind. The minimum maturation period is 21 days from the day of renneting. Immediately after the cheese is removed from its forms/ hoops, it is ringed with a spruce band and placed in a spruce box. Local woodworking expertise led to the production of soft bands made of stretched bark from spruce trees native to the area. Tradtionally, Vacherin Mont d’Or is made from raw milk, but there is some that is produced with thermised milk and mixed with cultures of lactic acid bacteria to comply with USFDA cheese importing regulations. Also, modern production techniques have further reduced renneting time by increasing the renneting temperature. However, the pine box still serves to conserve the moist, fatty cheese. Categories: Cheese Profile, Uncategorized | Tags: Animal Rennet, Cheese Profile, Cow, Cow's Milk, Switzerland, Vacherin Mont d'Or, Washed, Washed Rind | Permalink. Lactose is a type of sugar found in milk and other dairy products. Human babies are born with the enzyme lactase, which “breaks down” lactose by cleaving it into the two monosaccharides glucose and galactose for easier digestion. When the small intestine does not make enough of the enzyme lactase, is not able to digest lactose and lactase deficiency, or lactose intolerance, occurs. Lactose consists of the two simple sugars, glucose and galactose, bonded together. The molecular structures of glucose and galactose are carbon rings surrounded by hydroxyl (-OH) groups and these hydroxyl groups are polar, which means that each group has separate regions of positive and negative charge. The fact that the -OH group is polar in nature enables lactose to mix well with the polar molecule water. Since whey is mostly water, when the whey is drained from the curds, most of the lactose that hasn’t been cleaved already is removed from the cheese when the whey is. As outlined by Professor Frank V. Kosikowski, adding starter culture to milk is the first step in the eight steps of cheesemaking. The starter culture initiates, or starts, the production of lactic acid through its fermentation of lactose — hence the name /starter/. Fermentation is a metabolic process in which an organism converts a carbohydrate, such as starch or a sugar, into an alcohol or an acid. Use of a starter culture provides a uniform, predictable, reproducible rate of acid production during cheese making. 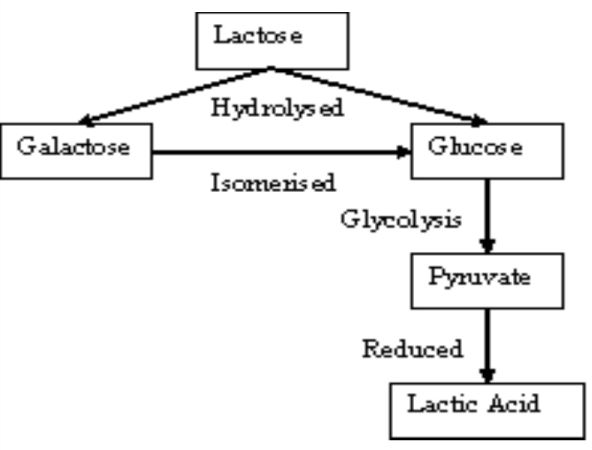 Once the lactose is cleaved into it’s simple sugar components, the glucose molecule is metabolised and undergoes glycolysis to produce pyruvate molecules. Pyruvate, or Pyruvic acid, supplies energy to living cells through the Krebs cycle (metabolic cycle for aerobic organisms) for the starter bacteria and alternatively ferments to produce lactic acid when oxygen is lacking. While it is true that a small amount of lactose is carried over into the cheese, it is very important because it serves as an energy source for bacteria present in the cheese. Although fresh cheeses typically contain some residual lactose that may be problematic to lactose-intolerant individuals, aged cheeses generally do not present a problem because the residual lactose is fermented to negligible levels during ripening/ aging. So, the bottom line is that most of the lactose is either lost to the whey or fermented by the starter culture during cheesemaking. P.F. Fox states that there is no lactose in many cheeses or only a very low concentration (1-3 g/ 100g) because most of the lactose of the milk passes into the whey and that retained in the cheese curd is partly or fully converted to lactic acid during cheese ripening. Paul Kindsedt. American Farmstead Cheese: The Complete Guide To Making and Selling Artisan Cheeses. Chelsea Green Publishing, 2005. P.F. Fox. Cheese: Chemistry, Physics and Microbiology: Volume 1: General Aspects. New York: Chapman & Hall, 1993. Categories: Chemistry | Tags: lactose, lactose free, lactose intolerant | Permalink. “How do you remember the tastes of all of these cheeses?” A customer said to me one day. The shop I work in has around 300 cheeses. When I began working I have to admit that I didn’t know where – or how – to begin. I started by trying cheeses I had never seen before and those that I’d always wanted to try and others still that looked interesting or had intriguing descriptions. However, I just wasn’t retaining all of the the cheese-taste connections in my memory. A few exceptionally delicious ones did stay glued in my head, but many others unstuck before the shift was over. Do all cheeses from the Piedmont region of Italy taste the same? My cheesemonger companions gave me some excellent advice – which was to select a few cheeses from a major cheese category (soft, semi-soft, firm, blue-veined, and fresh) and taste them. Compare them to one another – is one more grassy or citrusy than the other? Does one have a creamier texture while one more dense and fudgy? Once you develop a good foundation, you can begin creating your own categories – perhaps by trying various goat tommes or only cheeses from Spain. Approaching cheese tasting in this manner will help you better remember the names and tastes of the cheeses you try, learn what types of cheeses you like (or don’t like,) and the diversity of flavors within any one category of cheese and you will begin to have the confidence to navigate yourself around the cheese counter. And as always, you can always ask advice from your cheesemonger! 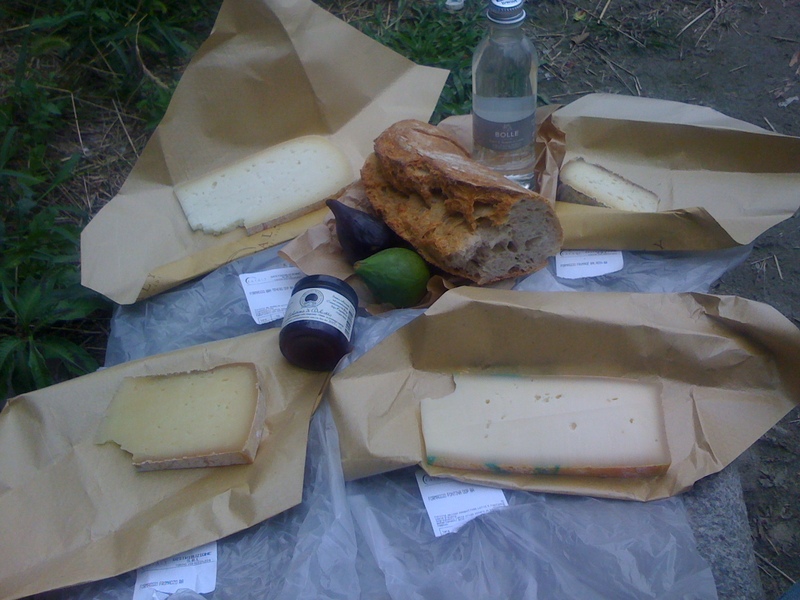 Categories: Cheese 101 | Tags: how to eat cheese | Permalink.